I’ve always said, it’s so easy to cultivate your feeling into sadness, and frustration when things don’t work out, the heart aches we cause ourselves and lets not discuss the anxiety, and feeling overwhelmed. Take a step back, and replay the scenario in your head. Where did I miss calculate or better yet, did I prepare myself for failure, by not completely understanding the task at hand. Create the happiness, you seek not by setting yourself up for disaster. There’s where the frustrations starts and getting upset at ourselves, but we already knew what to expect, don’t treat life-like playing the lotto. Don’t assume the best and end up with the worst. Those things will happen, if you don’t prepare why go through the motions. Create the happiness, for you and everyone else who cares about you and expects 100 percent effort in achieving your goal. If you start something finish strong, don’t quit in the middle, because things will only get harder for you. Once you’ve done it, than every-time you feel like the walls are closing in, you quit. Creating bad habits are hard to break, don’t start something you know you will not complete. We’ve all been there, signing up for the gym, or our health diet, don’t mis-understand my message. It’s great to do those things and set targets for ourselves but, knowing ourselves is key. Don’t set yourself up for failure, go to the gym, and start your diet, but limit yourself and make it fun. Parter up with someone, and encourage each other, it’s called team work, together you win. 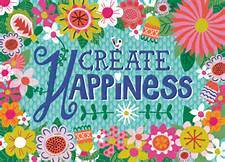 Creating the happiness you seek. I say these things because, life is already tough. Things will happen, we don’t live forever, but that’s doesn’t mean we stop creating happiness for ourselves and others. Life is fun, and met to be shared with others. So start today, create the happiness, you seek and share it with others. As for me, my blogs and posting help me it’s something I need, it bring peace of mind and assures me better days are yet to come. My family and friends, help me and by their comfort and support reassured me things are just fine. I’m not much for getting out, I feel good and everyday always thinking of ways to create my happiness and helping others find happiness as well.